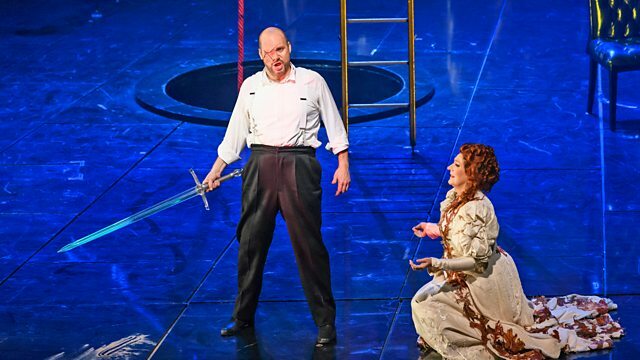 Das Rheingold, the first of the four operas comprising Wagner's Ring cycle, from the Royal Opera House with John Lundgren starring as Wotan, and conducted by Antonio Pappano. In Das Rheingold, the first opera in the Ring cycle, Wagner lays out the theme of love versus power which will resound through the four operas in the Ring cycle. It's a world of mythical giants and castles, magic potions and scheming dwarves, and the central toxic influence of the all-powerful ring, guarded by the Rhinemaidens. A lecherous Nibelung dwarf called Alberich renounces love and steals the gold from the Rhinemaidens, and heads to Nibelheim where he builds an empire based on fear and slave labour. We also meet Wotan the chief god in his castle Valhalla, which he had built by the giants, and who when he hears of the all-powerful ring, decides he wants it for himself, and in turn steals it from Alberich. The Orchestra of the Royal Opera House and a stellar cast led by John Lundgren as Wotan is conducted by Antonio Pappano, and the cycle is presented by Tom Service. The branches of the World Ash Tree held together the universe:; Riesenheim, home of the giants; the earth, with the Rhine and his daughters; and Nibelheim, inhabited by the Nibelungs. The god Wotan drank from the spring of eternal knowledge beneath the World Ash Tree, sacrificing an eye in return for wisdom.. The three Rhinedaughters – Woglinde, Wellgunde and Flosshilde – are playing. Alberich, a Nibelung, watches them, utterly enchanted. Sunlight falls on the gold. Alberich asks about the treasure. They tell him that it is the Rhinegold, which if made into a ring would give its owner infinite power over the world; it can be forged, however, only by someone who renounces love. Alberich seizes the gold. Fricka sees the fortress built for the gods by the giants Fafner and Fasolt. Wotan is overjoyed at the sight of it. Fricka reminds him that as payment he promised to give the giants her sister, Freia. She reproaches Wotan for his willingness to trade love for power, but he replies that he is depending on Loge’s ingenuity to solve the problem. Alberich, who stole the Rhinegold. Loge tells Wotan that the Rhinedaughters want his help to get it back. Fasolt and Fafner ask about the gold and Loge explains that a ring forged from it gives absolute power. Gods and giants alike are greedy for it. The giants say they will exchange Freia for Alberich’s treasure. As the giants leave with Freia, the gods rapidly age: without her apples they are helpless. Wotan resolves to get the gold and descends with Loge to Nibelheim. Alberich torments his brother Mime, who has made a magic helmet, the Tarnhelm. Mime tells Loge his tale of woe and recounts how the Nibelungs, once contented craftsmen, are enslaved by Alberich. Alberich returns, brandishing his ring and driving his terrified slaves back. Alberich turns himself into a giant figure, whereupon Loge and Wotan pretend to be frightened. When Loge asks if he can become very small, Alberich transforms himself into a toad. Wotan and Loge pounce on him, grab the Tarnhelm and drag him out of Nibelheim. Loge and Wotan mock Alberich and tell him that the cost of his freedom is his gold. Wotan now insists Alberich give him the ring too, Alberich’s sin was against himself alone; Wotan’s will be against all existence if he takes the ring. Wotan tears it away from Alberich, who puts a curse on it: it will bring anguish and death to those who possess it while everyone else will be consumed by envy. Freia returns with the giants, restoring the gods’ strength. Fasolt does not want to give Freia back, and orders that the gold be piled up to hide her from his sight. Erda, the earth goddess, appears. She reminds Wotan of the curse on the ring and says a dark day is dawning for the gods: he must surrender the ring. Erda disappears and Wotan agrees to hand over the ring. Freia is freed. When Fasolt seizes the ring, Fafner kills him. A rainbow bridge leads the gods to their new fortress, which Wotan names Valhalla (hall of the slain). Singer: John Lundgren. Singer: Johannes Martin Kränzle. Singer: Dame Sarah Connolly. Orchestra: Orchestra of the Royal Opera House, Covent Garden. Conductor: Sir Antonio Pappano.